Matter falling into a supermassive black hole creates jets of material that travel at nearly the speed of light. Studying the gamma-ray spectrum of these jets as their path is bent by the gravity of another galaxy can help scientists to better understand their emission. A telescope in space has captured a rare kind of cosmic allignment for the first time. NASA's Fermi telescope has captured the first gamma-ray measurements of a gravitational lens, a rare natural alignment in which a massive body distorts light from a more distant object. A team of international astronomers used the observatory to study the emission from one galaxy as its energetic emissions passed through another spiral galaxy on their way toward Earth. "We began thinking about the possibility of making this observation a couple years after Fermi launched," lead scientist Teddy Cheung, of the Naval Research Laboratory in Washington, said in a statement. "All of the pieces finally came together in late 2012." Known as an active galaxy, B0218+357 contains a supermassive black hole at its center. 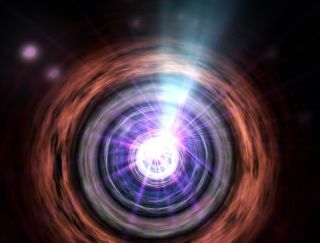 As matter spirals into the black hole, some of the particles accelerate outward at near-relativistic speeds, forming two jets that appear at a variety of perspectives as seen from the Earth. In active galaxies known as blazers, the jets point directly towards Earth. This NASA illustration shows the components of a gravitational lens system known as B0218+357. The different sight lines to the background blazar result in two images of outbursts at slightly different times. NASA's Fermi made the first gamma-ray measurements of this delay in a lens system. Between the solar system and the active galaxy lays another spiral galaxy that functions as the natural telescope known as a gravitational lens. Because the galaxy between the Fermi spacecraft and the source is so massive, it bends light waves into different paths significantly enough that astronomers can observe the differences. Data of B0218+357 taken by Fermi's Large Area Telescope (LAT) reveal dual images separated by only a third of an arcsecond — less than 0.0001 of a degree — setting the record for the smallest separation of any known lensed system. The LAT can't capture the individual blazar images that optical and radio telescopes observe. Instead, it exploited a "delayed playback" effect, created because one path of light is longer than the other. The farther-traveling waves can arrive days behind the first. In September 2012, flares from the blazar made it the brightest gamma-ray source in the sky outside of the Milky Way. Cheung and his team turned Fermi towards the active source in hopes of capturing delayed flares. At the American Astronomical Society meeting in National Harbor, Maryland earlier in January, Cheung described three episodes of flares showing playback delays of 11.46 days. This Hubble Space Telescope image of gravitational lens B0218+357 reveals two bright sources separated by about a third of an arcsecond, each an image of the background blazar. Spiral arms belonging to the lensing galaxy also can be seen. B0218+357 boasts the smallest separation of lensed images currently known. The gamma-rays themselves arrive about a day after radio waves. Astronomers think this stems from the fact that the source of the two types of waves come from different parts of the blazar, and so take slightly different paths through the lens. At the same time, although gamma-ray readings remained fairly constant, one radio wave image shows the blazar four times brighter than the other. "Over the course of a day, one of these flares can brighten the blazar by 10 times in gamma rays, but only 10 percent in visible light and radio," Stefan Larsson of Seden's Stockholm University said in a statement. Larsson worked on the team with Cheung. "[This] tells us that the region emitting gamma rays is very small compared to those emitting at lower energies," Larsson said. As a result, the gravity from the lensing galaxy may have a stronger effect on gamma-rays. The team's research will be published in an upcoming issue of the Astrophysical Journal Letters.